Form Description: Your fleet is an important part of your business. The cars and trucks that keep you moving are essential to providing the goods and services that your customers want. Make sure that they stay in peak condition with the help of our automotive maintenance logs. Our basic log includes the vehicle's license number, make, model, and year, and the purchase date, as well as a table for all of your service entries with the date, mileage, the type of work, who did it, their initials, and when the vehicle is next due for servicing. This version is formatted for easy duplication for your convenience. This form is in full-page landscape format. You can download a PDF version of the "Easy-Copy Basic Automotive Maintenance Log (Wide)" form absolutely free. You can also, for a small payment, download a fully editable version of the form that you can customize as you desire. (Don't know which format to choose? Here's how to make your choice.) What would you like to do? 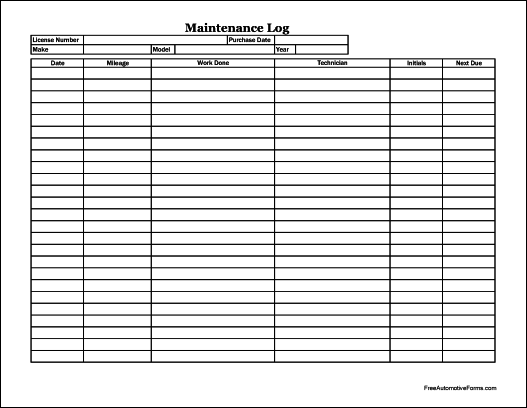 FreeAutomotiveForms' free "Easy-Copy Basic Automotive Maintenance Log (Wide)" form is associated with the following keywords: Vehicle Maintenance Log, Free Log Form, Equipment, Service Log.